Not everything in the Middle East, or more specifically in Palestine, is about politics. In this occupied nation, people are not only struggling for liberation and independence, but also to live a life that is as normal as possible under the difficult circumstances of Israeli oppression, persecution and segregation. People who are politically engaged may be inclined to dismiss such efforts of ordinary life as being of minor relevance, or may perhaps even entertain a negative view towards any activities that draw attention away from the struggle. This way of thinking may be understandable from an emotional point of view, but misses some important points which become obvious when the subject is approached from a more rational angle. 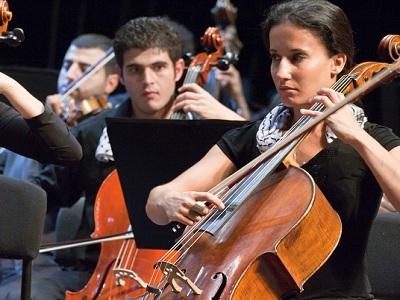 The Palestine Youth Orchestra was established by the Edward Said National Conservatory of Music, aiming to bring together Palestinian musicians from all over the world into an ambitious collective effort, hoping to achieve the same standards of performance as similar orchestras of other nations. In order to illustrate the point made above, the potential for a powerful positive influence of endeavors such as these can easily be made tangible and understandable. It must already be obvious that the struggle for Palestinian liberation and independence does not benefit in any way from isolationism. On the contrary, reaching out to the peoples of the world is an important method of creating worldwide understanding and recognition for our aspirations as a nation. Of course we would love to see people everywhere giving their unconditional blessings to those among our people who protest against the Israeli occupation in the streets, but this is difficult to achieve if there is little awareness of who we really are as a people. In more simple terms: people who are only known for their anger, no matter how justified that anger is, do not easily make friends. In the face of an intense campaign of dehumanization in Western mainstream media, where efforts are made to mendaciously depict Palestinians as ‘terrorists’ incapable of displaying any behavior above the level of violent barbarism, there is a real and significant need to counter this distorted image. For people to see the Palestinians as they really are, a sophisticated, proud and ambitious nation that attaches a high value to education, culture and refinement, the audience must be brought into contact with Palestinians who engage in ordinary societal activities. These activities cannot be caught within some limited definition. Rather, they entail any activities that bring people together, which automatically includes all forms of artistic, intellectual or physical expression such as music, sports, literature, acting, film-making and dance, to mention only a few. Whenever people from outside of Palestine see Palestinians engaging in such activities, their one-dimensional image of the angry Palestinian resistance fighter suffers a major blow, and they discover that Palestinians are a people just like any other, with hopes, dreams and ambitions indistinguishable from their own. When such bridges of identification are built, demonization efforts as undertaken by the Zionist-influenced media and entertainment industry of the West become thwarted in a way that poses a significant challenge to their otherwise overwhelming clout. The Palestine Youth Orchestra provides an excellent way to build these bridges, not only between East and West but also between Palestinians within Palestine and those in the diaspora. These latter bridges are of at least equal importance as the former, since they counteract the continuous attempts of the Israelis to drive as many wedges as possible between Palestinians who have been driven apart by geographical separation. In this role, the Palestine Youth Orchestra functions as a mesmerizing ambassador for our people, with more bridge-building potential than any political ambassador could ever have. This can be illustrated by examples: in recognition of Palestine being its most recent member, and in respect of Palestine’s recent cultural landmark achievements, the Palestine Youth Orchestra received patronage from the Italian National Commission of UNESCO in 2012 for its tour of Italy. The Palestine Youth Orchestra has also performed in Jordan, Greece, Lebanon, Syria, Germany, Bahrain and Palestine. Plans for 2013 include performances in Palestinian towns and cities, before continuing its tour in Jordan, Abu Dhabi, Dubai and Busan (South Korea). The 75 musicians participating in the Palestine Youth Orchestra comprise of male and female students of music between 13 – 26 years of age, some of whom study in and outside of Palestine, and some having recently graduated and standing at the beginning of their musical careers. They include Palestinians from the diaspora, from countries such as Jordan, Lebanon, Syria, Algeria and Egypt, as well as from countries outside of the Middle East. Not only does the Orchestra strengthen the ties between the various communities of our people, but it also serves to protect, maintain, and further develop our cultural heritage and collective identity. The Edward Said National Conservatory was founded in 1993, and named after the late intellectual giant and music lover Prof. Edward Said in 2004. It currently has five branches located in Jerusalem, Ramallah, Bethlehem, Nablus and Gaza, with over 1000 students altogether. The institution lives up to the vision of its namesake by providing a solid basis for Palestinian musical education. In doing so, it pays due respect to Arabic classical music as much as it does to the widely established tradition of Western classical music, with its worldwide cosmopolitan appeal and recognition. Besides this, it has an eye for the preservation and continuation of Palestinian traditional music as well, and also reaches out to more modern forms of musical expression. The fact that my musical project, the Musical Intifada, which encompasses many different styles of contemporary music and often merges them with traditional Palestinian influences, recently received a statement of recognition from the Edward Said National Conservatory, illustrates the broad vision that rules this prominent institution. My music has a modern sound with a strong emphasis on the Palestinian struggle in its themes, which is a far stretch from the Palestine Youth Orchestra performing Beethoven or Brahms in a concert hall in Europe. Still, the Edward Said National Conservatory clearly has the broadness of vision to realize and express that this is all part and parcel of what Palestine has to offer, and that comprehensiveness is the key that opens the door to the world, and invites it to meet the Palestinian people through their music. It should come as no surprise that considering the dire situation of the occupation, which besides the hardships of its Apartheid politics continues to pose a severe economical burden upon the Palestinian people, it can never be easy for an institution like the Edward Said National Conservatory to make ends meet. Hopefully, people all over the world realize how important it is for the Palestinians to have and cherish such institutions of musical education. I believe that whoever supports such endeavors is helping our people realize their aspirations and ambitions in a very significant way, and I therefore call upon all who read this to reach out to the Conservatory and at least lend their moral support to it, and if possible also their financial support. Every donation, no matter how small, helps in making a difference, and maintaining an educational institution that has grown to become one of the main pillars of our cultural identity and development. – Tariq Shadid is a surgeon living in the Arab Gulf who has been contributing articles to the Palestine Chronicle for many years. Some of these essays have been bundled in the book ‘Understanding Palestine’, which is available on Amazon.com. He also is the founder of the website ‘Musical Intifada’ featuring his songs about the Palestinian cause, on www.docjazz.com. He contributed this article to PalestineChronicle.com. Beautiful strong people playing beautiful strong music. Id like to hear the whole concert? Hugely Inspiring. Thank you. I hope you can come to Canada. Second Brother Lake’s comment … would love to hear you live in Toronto.